Another Old And Rare Photo Of Salman Khan And Sridevi Going Viral Is Making Us Nostalgic! Many rare and old photos of celebrities have been doing rounds on social media and making us nostalgic, and one such photo is of Salman Khan and Sridevi. It’s really unfortunate that the legendary actress is not among us anymore, and this makes our heart cry. 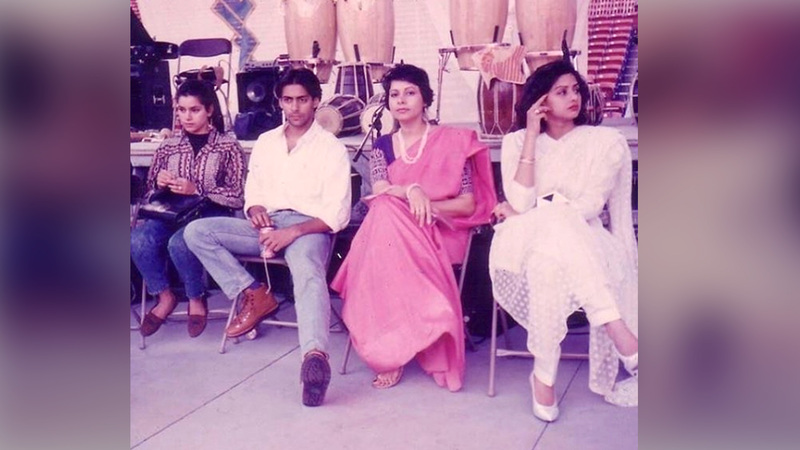 In the photo we see Sridevi dressed in a white kurta-pyjama looking radiant, just like Chandni, and next to her young Salman Khan is sitting with a can in his hand looking a bit tense. We were also able to notice Neelam Kothari sitting right next to Salman. Well, this photo of these stars is making us nostalgic for sure. A few days ago, Amitabh Bachchan shared a photo from his London concert, where we saw Salman Khan and Aamir Khan on their very first tour with Big B. Sridevi was also there in the picture looking mesmerising. In the photo, Salman was looking star struck and it was clear that he was having a fanboy moment! On the work front, Salman Khan is busy promoting for his upcoming film ‘Bharat’ with Katrina Kaif, directed by Ali Abbas Zafar and produced by Atul Agnihotri. The film also stars Disha Patani, Tabu, Jackie Shroff and Sunil Grover.